destroying data Archives | W C Computer Recycler, Inc.
Why should you use data destruction services? The threat of identity fraud is more pressing than ever. Seemingly every week, news stories appear detailing another attack on an individual or business whose identity has been used to commit fraud. Safe disposal of electronic information is therefore crucial to help minimize the risk of this happening. As more and more people become reliant on technology in their home and working lives, the amount of data being stored on PCs and laptops has grown enormously. When these computers pass onto to other owners or are replaced at the end of their useful lifetime, the data contained within could be used by all manner of criminals to help endanger your privacy. The software options available to ‘wipe’ a hard drive are not always secure. Some programs are successful in erasing all the confidential information on the disc, but others only remove the file directories – the information remains untouched. Other software is available which can then restore the directories and access this private data, making the personal documents or company transactions visible once more. In most cases, those that would use such software to restore information are not doing so for honest reasons. Data destruction services physically destroy the hard drive, making it unreadable. This is really the only secure way of permanently preventing the information being retrieved and used criminally. A hard drive contains a platter or disc inside the casing, on which the data is written. Using an industrial drill process to shatter and corrupt this platter prevents any other device being able to ‘read’ the disc and obtain its contents. Although many people attempt to do this at home, for the utmost security it is imperative to use a professional service and perhaps hire a data destruction firm in Orange County. In recycling, the iron based metals and the non-ferrous components are removed, before copper elements, printed circuit boards and plastic parts are also removed. In many instances, these can be reused in new devices. Using a full data destruction service offers the peace of mind that it is impossible for the data to be recovered and to fall into the wrong hands. Data protection legislation states that all personal information must be securely disposed of at such a time when it is no longer required. Although destroying hard drives at home might sometimes work, using a company offering this service will create a paper trail which protects the company from claims of malpractice: should there be an audit, for example, being able to offer the dates and details of using data destruction companies would be very beneficial. When replacing a computer, many people do not stop to consider the data held in the hard drives of the old unit. Selling this to another party could allow them access to confidential personal information, including credit card numbers and bank details. 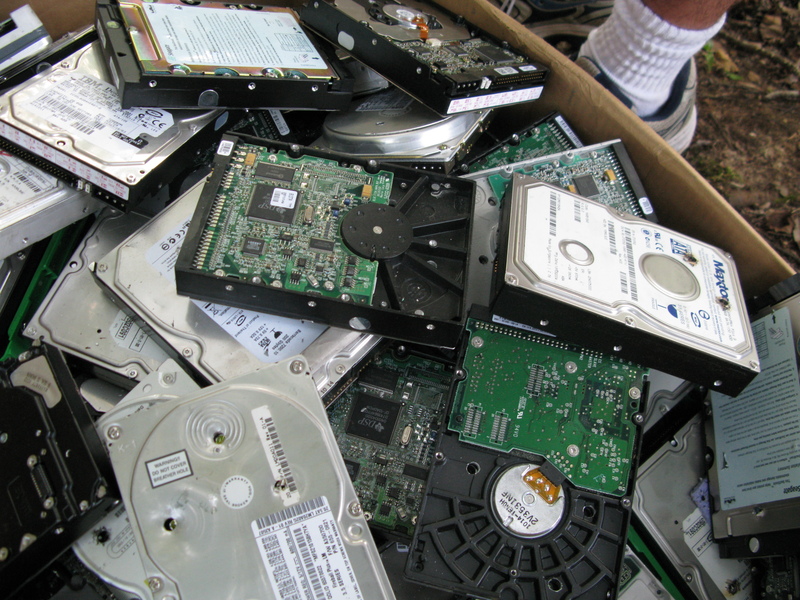 Even recycling plants have been known to resell computer parts, meaning potentially useful information could be purchased by criminal organizations. Given the rise of internet banking and widespread transfer of personal details through computer equipment, it has become more important than ever to destroy this data when the computer is no longer in use. Doing this at home, however, is not always recommended– people make mistakes when they do not fully understand their task, and there can be serious consequences. A wide range of programs are available to ‘delete’ data on hard drives, but in most cases these are not completely effective. If a hard drive has been ‘wiped’ in this way, a determined criminal would likely be able to recover the information. Governmental standard says that seven passes of an over-writer, putting data on top of the existing records, would be sufficient to make the original information illegible – but at home most people would run the program once and assume it has completed its task. Data on hard drives is stored on ‘platters,’ disk-like elements which spin inside the housing. It is these platters which need to be destroyed to make the data inaccessible. In many cases, physical force is used to damage this beyond repair. However, this is not as simple as might be expected. Russell Chozick of Flashback Data, an American based data recovery company, said in an interview that data could be recovered even from hard drives which had been bent in half during their disposal in landfill. Two methods are recommended by internet forums for destruction at home: the hammer and the drill. Depending on the kind of hard drive, the platter is sometimes made of a material which can be shattered with sufficient attack with a sledgehammer. Instructions for this recommend taking the platter out of its casing and hitting it on the street. The alternative is to drill at least four holes through the unit, hoping that these prevent any information being recovered. For the most sensitive information, at home destruction is not likely to be the most efficient method. Professional degaussing uses magnetic fields to corrupt the data, minimising the likelihood of identity theft or fraud. If you are looking for Data Destruction Services in Irvine CA or Los Angeles County, contact a professional company such as West Coast Recycler.